My children have been trying out the Fisher Price Code-a-Pillar and putting it through it's paces. The Code-a-Pillar is a new innovation in pre-school learning which teaches the foundational skills to coding. My children are five and seven years old and the Code-A-Pillar is aimed at three to six years old. My first impression of the Code-a-Pillar was that it looked like a toy for younger children. I was also a little unimpressed with the amount of noise it made! However, once I got it out of the box and realised how simple it was to use and how it can be used on many different levels. For example, younger children can play matching colours and older children can use more complex sequences and try to reach targets. The Code-a-Pillar enables allows young programmers to configure the 9 easy-to-connect segments in different combinations. This sends the Code-a-Pillar on its path: forward, left, right, or even wait for a couple seconds before moving again. Every time children change and rearrange the segments and put the Code-a-Pillar back together, it takes a different path. Although the Code-a-Pillar is a pre-school learning toy, there is plenty for key stage one school age children to learn from it too. The more that children rearrange the segments, the more they develop problem solving skills through programming different combinations. They can then expand their sequencing knowledge and allows them to critically think about how to make the Code-a-Pillar reach different targets on the floor. We have really enjoyed playing with the Code-a-Pillar and I found it really interesting how differently both my children played with it. My son really enjoyed making courses for it to follow, with bridges and obstacles to swerve round. My daughter loved putting the segments into rainbow orders. They both loved the purple segment, which we named 'dance' and we all had to dance whenever it reached the purple one. 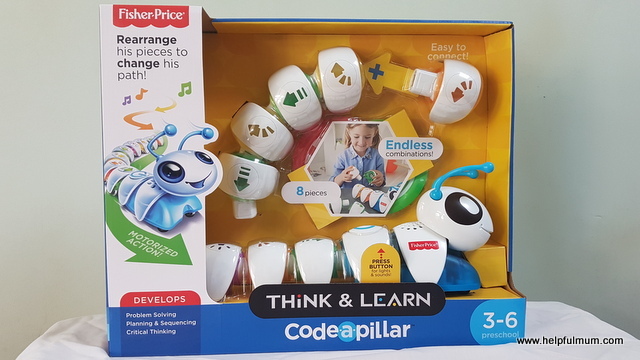 In addition to the Code-a-Pillar you can purchase separate segment packs, which mean that it can grow further, enabling children to explore even more possibilities. The Code-a-Pillar retails at £49.99 and you can also purchase separate add-on packs, each priced at £14.99. For more information, check out Fisher Price's website. Disclosure: We were sent the Fisher Price Code-a-Pillar for the purpose of this review. This had no impact on my post, which is honest and fair.